By popular demand, we've developed a dedicated Door Stile Press, for laminating veneered door stiles and rails, engineered flooring, etc. This Pod Press can produce a maximum 93,600 lbs. total platen force (9,360 lbs. per platen) at 120 psi supply air pressure, making it suitable for both lighter-duty (for example, high-pressure laminates to composite substrates) and heavier-duty (for example, wood veneering) applications. It has a fixed vertical daylight opening of 40" . 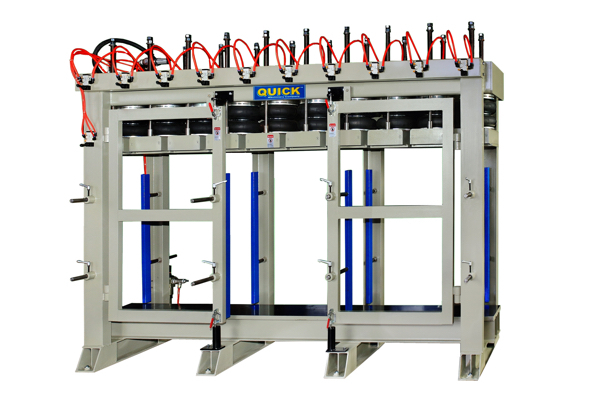 Vertical structural frame members and hinged containment fences arrangement allows for both end-loading and side-loading of material into the press. Horizontally-adjustable vertical containment fences keep the laminated material from sliding while under pressure. The (10) 10"" maximum diameter air pods have 5" stroke. Each air pod has its own hand-operated air valve, so each air pod (and therefore each platen) can be activated individually. There is also a main air valve, which controls all "activated" air pods at once. Therefore, any number of air pods can be controlled together, or each air pod can be controlled separately, as desired.